Posted by Jake Rome on December 28, 2011; This entry is filed under Running. Survey link is included in the email only! What can I say? It was an awesome day! Perfect weather, and we had 4 great runners win the men’s & women’s races, topping nearly all of the course records from 2010. A total of 212 completed the half marathon led by first finisher of the day Patrick Sweeney. And 106 finished the marathon, highlighted by the perseverance of Margaret Tollner and Christy Borza. Sam’s got a great blog post, and so does half marathon winner Pat Sweeney; I encourage everyone to link to their own story on our blog or Facebook page. Results are now posted at Gemini Timing. Photos from Doug Brenizer are being uploaded to his SurfDaddy Photography website, and photos from our Montana Berg will be uploaded there as well. So far several hundred photos have been uploaded and that number should double in the coming week. As noted in an earlier blog post, we’re making the photos available for much less than race photographers typically charge. With a donation of $10 to Operation Jack, you can download 10 medium resolution photos (more than large enough for sharing via email or Facebook), and with a donation of $25 you can download 10 high resolution (great for printing). 100% of the proceeds benefit Operation Jack. Simply make a donation, then send an email to jake@core4you.org with the list of photos you want. I’ll send the photos or instructions how to download them in about a week– I’ll try to get them sooner, but that’s the best I can promise. Full details are in the blog post, just remember that if we raise $1000 then everything is free. Until then, everyone can view them on site, and easily share your favorites with one click with your Facebook friends. We’re working on tagging the photos to make them easily searchable, hopefully that will be complete by the time this post goes officially live. In the meantime, you can also check out photos from another supporter that was near Mile 4. 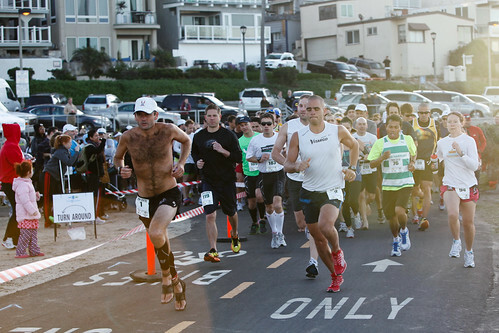 The Hermosa 24 is an ultramarathon & relay held on the soft sand between the Hermosa Beach and Manhattan Beach piers. Last year nearly 100 runners participated, running through the night and camping on site while watching the World Record be set for the 2nd year in a row. Collect your team & sign up today at: https://www.hermosa24.com. If you want to participate but don’t have a team, contact jake@core4you.org. 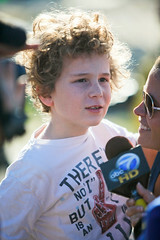 Check out this news report from ABC7 here in Los Angeles, and read more about the race in the Manhattan Beach Patch. Finally, the most popular weekly in the beach cities also published an article. The short: over 300 runners & 50 volunteers and dozens more spectators. Likely over $40,000 raised by the time it’s all over with. Perfect weather. And thousands of smiles. It was a ton of work for the volunteers & organizers, but seeing the results made it all worthwhile & then some. In addition, 20 runners in Houston, 20 soldiers in Kabul and about 50 athletes in Portland, Oregon completed Operation Jack Satellite events. And nearly 100 more did satellite races on their own or with a few friends. Like us on Facebook, and follow Sam on Twitter and via his Operation Jack blog. If you want to raise money for Autism charities while training for a marathon or triathlon, learn more about Train 4 Autism on their website & like the Facebook page. And if you live in LA’s South Bay, like the CORE page to stay in touch with the local recreation news. Celliant is a revolutionary technology that harnesses the body’s natural energy through the use of minerals and fibers. Products containing Celliant have been clinically proven to increase blood flow and blood oxygen levels in the tissue and help balance temperature. Learn more at: http://www.celliant.com/. Obviously there’s a lot of planning to do. The Operation Jack Marathon & Half will return in 2012, most likely on December 29. We’ll update everyone once the date is finalized and registration opens. In addition, there will be more satellite events– not only in Oregon & Texas, but supporters have already expressed interest in hosting events in Arizona, Vermont & Mississippi. We’ll have an update on that later, ping sam@operationjack.org if you’d like to host an event in 2012– we’ll handle the t-shirts, medals, registration, bibs & marketing. You just need to find a course! You can still donate through the event page through any runner, and funnel it through our photos page to help Free the Photos! All donations are tax deductible to the extent allowed by law, etc.